It begins with a love story. A love that is almost too sweet, too perfect. From that love comes a child. Life is wonderful. Until something unspeakably vile scuttles out of the shadows and steals the child away. Leaving a changeling in its place. But this is no ordinary fairy tale. C. Robert Cargill has written a modern American tale. A tale that twines the real world with the supernatural. A tale of faerie changed. Faerie that has danced alongside our world. It is a realm that we visit with two boys. It is a dark, dark place to grow up. Reading Dreams and Shadows is akin to entering an ethereal world: a world that is familiar enough and yet not, a world that sparks the imagination and haunts dreams. The coming-of-age story makes up only the barest bones of this narrative, and the rest is a rich mix of fable, history and mythology, making it difficult to distinguish the real from the unreal. Cargill has opted to tell his story by interweaving narrative sequences with excerpts from the works of a fictional expert in the mystical, a Dr. Thaddeus Ray. It’s a wonderful world – vivid, extraordinary and rich in detail, conveyed through these ‘factual’ essays, and the action of the story is allowed to progress without any awkward info-dumping. I think it’s a clever way to tell a story, especially one such as this where so much depends on the reader knowing the origins, habits and peculiarities of the supernatural creatures that populate the world. This is undoubtably my favourite feature of the book, but it’s a hard choice between this, the delivery, and the content itself. 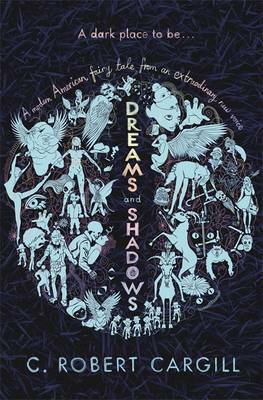 Dreams and Shadows follows Ewan and Colby, boys who embroiled in the otherworld, from youth to adulthood, but it’s not just about them. It’s about Knocks, Ewan’s jealous Changeling who wants to strip him of everything, it’s about Yashar, the cursed djinn that brings Colby into the supernatural world, and a few dozen other fey who weave in and out of the boy’s lives, sometimes bringing laughter, oftentimes destruction, and even death. Refreshingly, the characters are well-developed, complete, and only very loosely fit into archetypes, which means that they are never predictable. The other thing I really like about this novel is that it’s a thinking book. It forces readers to reevaluate what they know about the nature of the Sidhe, about whether they truly mean harm or whether they are unaware of how destructive they can be. Cargill also examines consequences – are you evil if your intentions are good but you end up destroying someone’s life – and the idea of a good man versus a truly selfless one. These are all deep issues, tackled at various times in the book, and while it doesn’t feel like the author is preaching, it had me reflecting on these issues when I was away from it. I can’t recommend Dreams and Shadows highly enough, and I think that readers will not be disappointed in it. It’s not a light read, or triumphant or even really hopeful, but within the darkness and despair there is a glimmer of something real, which in the end is better than false happiness. I am in awe of Cargill’s story-telling skills, and hope he writes more books so I can devour them like I did this one.